Sink into the soft pile lining that'll keep your feet warm and comfy. 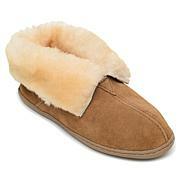 These classic bootie slippers are made by hand from genuine suede and have a thin rubber sole. FINALLY found slippers that are comfy on my feet! I don't think these are "true" wides, but if you have a medium-wide foot, these give you that little bit of extra width without being "floppy" on your feet. Very soft both inside and out. Finally my feet feel good! I ordered a size up, since my size was not available, and the wide width of these is perfect for me. I have diabetic neuropathy and bunions, so it is hard for me to find comfortable shoes, but I love these. I have tried other styles of Minnetonka shoes before; they are all good quality. I know they are slippers, not shoes, but because of the hard sole, I decided to wear them to church this morning. Nobody commented, but if they had, I would have told them to try walking a mile in my shoes. I was so looking forward to these slippers. However, when I put them on, they were far too short. I ordered an 11W and they felt more like a 9.5W. Im returning them ASAP. 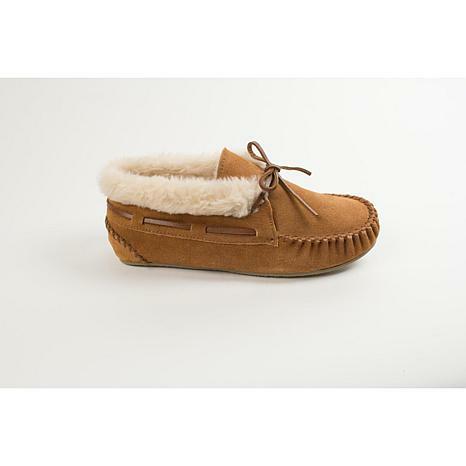 This cozy pull-on slipper features soft, durable suede with a fun faux fur cuff and lining, plus a rawhide lace to adjust to the perfect fit. The heel-to-toe comfort cushion insole nestles your child's feet while the durable rubber sole provides sure footing wherever they may go. Cozy comfort with a splash of elegance. 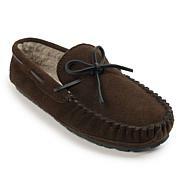 Sink your feet into suede moccasin slippers and relax in style. Featuring a textured sole and faux fur lining, they'll make indoor lounging and quick treks outdoors a pleasure. For long car trips, hotel stays or weekends at mom's or the kid's — perfect.